1 of 3 Place cabbage and apples in slow cooker. Stir in vinegar, sugar, caraway seeds, and 1/4 teaspoon salt and pepper. 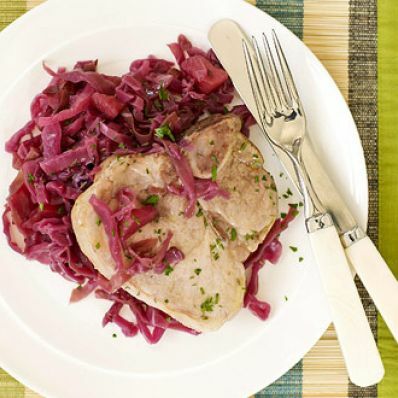 2 of 3 Place pork chops in slow cooker over cabbage and sprinkle with 1/4 teaspoon pepper. Cover and cook on HIGH for about 3-1/2 hours or LOW for 7 hours or until cabbage is softened. 3 of 3 Remove pork from slow cooker and keep warm. Using a ladle, remove 2 tablespoons liquid from slow cooker and place in a small bowl. Whisk cornstarch into liquid in bowl. Clear cabbage aside in slow cooker and whisk cornstarch mixture back into slow cooker. Using tongs, toss thickened liquid with cabbage and stir in remaining 1/4 teaspoon salt. Serve with pork immediately. Per Serving: 71 mg chol., 3 g sat. fat, 335 kcal cal., 6 g fiber, 412 mg sodium, 8 g Fat, total, 32 g pro., 35 g carb.